After years of using revenue from a road tax to pay for criminal justice costs, including the jail, Cook County will put the money back into transportation in next year’s budget. The decision by the Board of Commissioners last month underscores how expenses for criminal justice affect local government budgets and claim a large share of taxpayer dollars – often to the detriment of other services, according to advocates for criminal justice reform. The jail is a significant part of the county budget at $327 million out of a total budget of $ 4.5 billion in 2016. The spending issue also feeds into an ongoing conversation about taxation, public services and racial equity in Cook County. The commissioners’ response is a new transportation plan that emphasizes equity. By directing revenue from the motor fuel tax to roads, the county will add $45 million to next year’s transportation budget, which officials say will focus on leveraging projects to create jobs and economic development. The plan could be especially beneficial in low-income and communities of color in southern Cook, which has a large African-American population. Those communities have some of the longest commute times because of inadequate public transportation, according to transportation studies. The plan, the first new county transportation plan in 70 years, will improve road maintenance, upgrade freight and public transit and identify new investment sources for transit. As jobs move to the suburbs, places like Schaumburg and the area around O’Hare Airport have become employment hubs. But the areas are not well served by public transportation. The county’s decision is in line with a state constitutional amendment that will appear on the November ballot. The amendment aims to prevent the cash-strapped state from dipping into revenues generated from motor fuel taxes, license fees and vehicle registration to fill budget holes. Illinois drivers pay the 19 cents per gallon gas tax, known as the state motor fuel tax, every time they fill up their vehicles at the pump. As more attention has been paid to crumbling roads and infrastructure there’s been a push to put the gas tax in a “lockbox,” restricting it to just transportation projects. Illinois statute allows local governments to divert motor fuel funds to pay for other services and programs, including jails and criminal justice. Karen Martin, assistant professor of public policy at John Jay College of Criminal Justice in New York, said safe and reliable roads are part of public safety, especially in places like Chicago where winter weather has a big impact on the quality of roads and infrastructure. But siphoning money from services that benefit everyone to an institution that benefits no one and disproportionately affects low-income blacks and Latinos is problematic, Martin added. The bottom line, Martin said, is that the nation’s criminal justice system is bloated, too expensive and needs to be scaled back. The decision to quit diverting the motor fuel tax was a compromise reached between Board President Toni Preckwinkle and the commissioners. In exchange, the county board approved a 1 percentage-point county sales tax increase. The county is hammering out how the money will be spent in next year’s budget. Commissioner Richard Boykin (1st) says the transportation plan is long overdue but it could do more to support equity. Though some cash-strapped communities will benefit from the plan, Boykin says the method for distributing money for projects could be based on need. 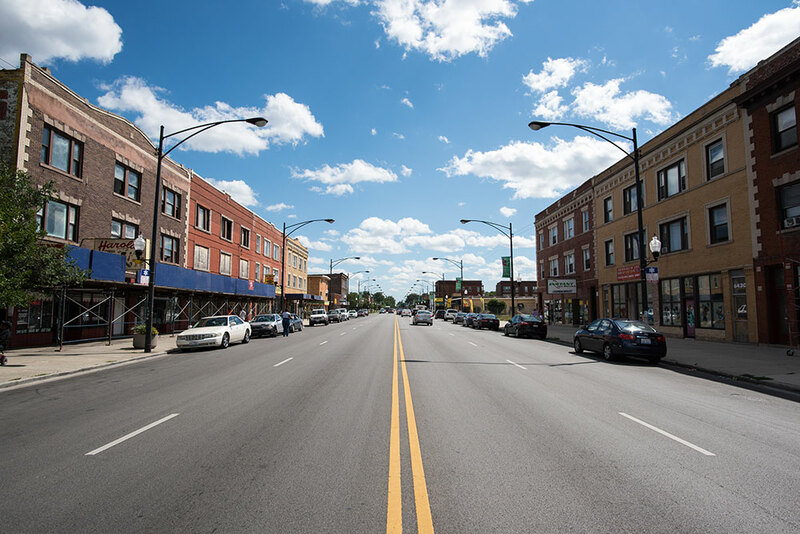 Since taking office two years ago, he said suburban towns in the western portion of his district, which includes Oak Park, Maywood, Bellwood, Broadview and parts of the city’s West Side, haven’t received money for road work. He said Bellwood and Maywood struggle to pay for infrastructure improvements like storm drains, curbs and gutters. “It is a very disappointing proposition that you have a whole segment of the population who’s paying gas tax but they are not getting a return on their investment. Poor people pay gas tax and we should not use poor people to subsidize wealthier districts,” Boykin said. “My district has been getting ignored and I am the gun violence district of all of the districts in terms of where gun violence is. So my district needs to the help the most,” he said, adding that transportation projects are jobs generators. County officials said funding for some roads tilts in favor of Northwest and South and Southwest suburbs because they have the majority of county roads. There are no county roads in the suburban portion of Boykin’s district, and the city portion contains a small number, they said. Last year, the county provided $250,000 in transportation funding to aldermen in his district through the city’s transportation department. As part of its long-range strategic plan, the county plans to work with municipalities with non-county roads to provide technical assistance and some matching dollars for federal funds for road projects. That represents a shift in the focus of the county’s Department of Transportation and Highways, which previously prioritized county-owned roads. Now the department looks for opportunities to invest where projects can bring new businesses, create or keep jobs, said Superintendent John Yonan. Garcia said the most important part of the county’s transportation plan is improving transit — getting people to jobs, spurring economic development and revitalizing communities.